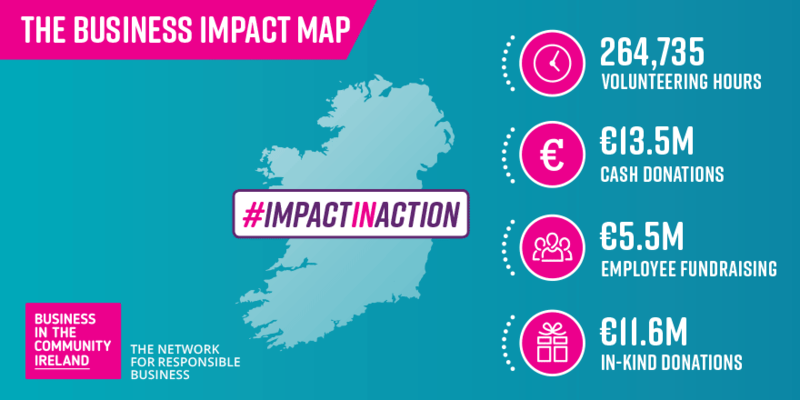 Press Release 28th March 2019: 60 top companies in Ireland have contributed over €30 million to charities and community groups last year while employees racked up 264,735 volunteer hours. Tomás Sercovich, Business in the Community Ireland Chief Executive said, “Employees want to work for companies that encourage volunteering as part of everyday business and crucially want to work where their values align with their employer. Companies understand the critical value of engaging in tackling social issues; it is a fundamental sustainability challenge. Employee engagement is a critical tool to attract and retain the best talent as employees now expect their employers to have a community strategy in place as standard”. The Business Impact Map was launched at an event today in the Lighthouse Cinema Dublin and was sponsored by Fujitsu. View the Business Impact Map and their the many impact stories from our member companies. Business in the Community Ireland members represented on the Business Impact Map are: A&L Goodbody, Abbott Laboratories Ireland, AbbVie, Accenture, Aldi, Bank of Ireland Group, Boots Ireland, BT, Central Bank of Ireland, Compass Group Ireland, Cook Medical Ireland Ltd., Cork Chamber, Dawn Meats Group, Deloitte, DePuy Synthes, Dublin Bus, eir, EirGrid plc, Energia, Enterprise Rent-a-Car, ESB Group, Fidelity Investments Ireland, Fujitsu Ireland, Gas Networks Ireland, HEINEKEN Ireland, Hovione Ireland, Intel Ireland, Irish Distillers Pernod Ricard, Janssen Pharmaceutical Sciences UC, Janssen Sciences Ireland UC, Johnson & Johnson (Ireland), Johnson & Johnson Vision Care, KBC Bank Ireland, KPMG, Lidl Ireland, Marks & Spencer (Ireland) Ltd, Mars Ireland, Matheson, Mazars, Momentum Support, Musgrave Group, National Lottery, Permanent TSB, PM Group, RTÉ, Servier (Ireland) Industries Ltd., Siemens Healthineers, SSE Ireland, State Street, Symantec, Tesco Ireland, Transdev Dublin Light Rail Limited, Ulster Bank Ireland DAC, Veolia, Verizon Media, Vermilion Energy, Virgin Media Ireland, Vodafone Ireland, William Fry and ZAGG International.